Three-lane strategy on PC and mobile. 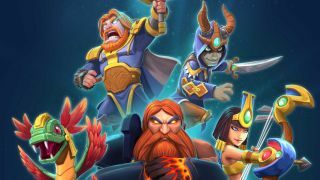 As Smite Tactics enters closed beta, Hi-Rez have announced another Smite-inspired card-based free to play game for PC. Where Tactics is a turn-based strategy game, Smite Rivals pits waves of minions against one another down three MOBA-inspired lanes. Players build decks of minions and powers as one of a number of Smite gods for quick, one-on-one battles. Clash Royale seems like a clear touchstone here, although notably Rivals will be available on PC as well as mobile. Cross-platform multiplayer hasn't been confirmed, but your progress (and your card collection) will persist across versions. If you're attending Hi-Rez Expo in person you'll be able to play it today: expect some hands-on impressions later. If not, you can sign up for the closed beta on the official site.